Following are the common Myths/Misconceptions about the In-Memory OLTP (a.k.a. Hekaton). Some of these Misconception I too had when heard of this concept initially, the white paper In-Memory OLTP White Paper by Kalen Delaney cleared all my doubts. As Memory Optimized Tables are Memory Resident, the Data is Not-Durable upon System Restart/Crash. REALITY: This Statement is both TRUE and FALSE. FALSE: Sql Server 2014 provides an option to create Memory Resident Memory Optimized Tables which can have durable data. If tables are created with this option, data will not be lost even upon System Restart/Crash. Data Durability is achieved by the DATA and DELTA files in the Memory Optimized file group and by writing to the Transaction Log but the amount of data which is written to the log is reduced considerably. Here DATA file’s will have the Inserted rows, whereas DELTA file will have the ID’s of the Deleted rows. On System Restart the Memory Optimized Tables Data is regenerated from DATA, DELTA files and the Transaction Log. 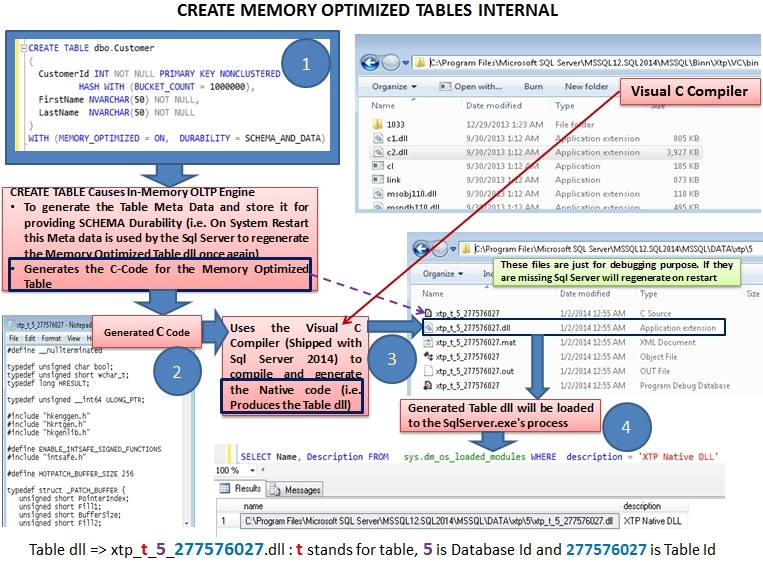 TRUE: If Memory Resident Memory Optimized Table is created without Data Durability option. Then System Restart/Crash etc will clear the complete Table Data. FALSE: Any modification to the Data of the Memory Optimized Tables created with Data Durability option needs to be written to the Transaction Log. This writing of log data by the Transaction Log Manger still has Latches. Logging for the Memory optimized table is much more efficient and the amount of log data generated is very less. As No logs are made for the index, schema/structure changes and UNDO information (i.e. Only Committed data is logged). 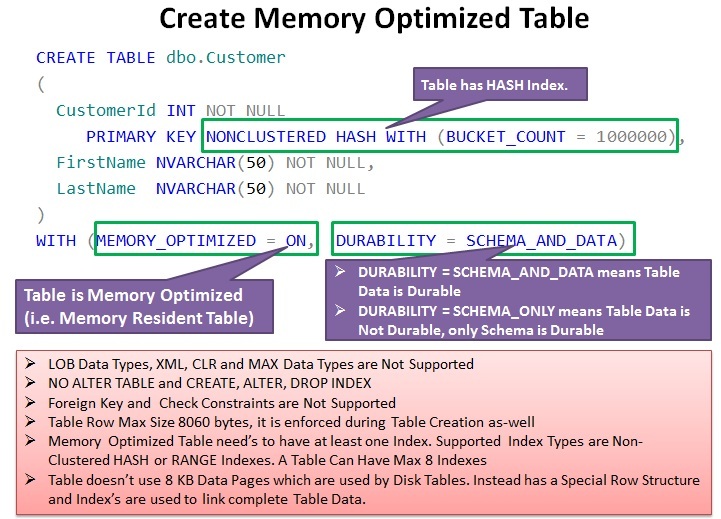 TRUE: Only for the Memory Optimized Tables which are created without Data Durability option. For such Tables there will not be any logging required, as they are designed to lose the data on System Restart. As there is NO Locking, Latching and Blocking, this will result in In-Consistent Data and Dirty Reads. FALSE: To Achieve NO Locking, Latching and Blocking, In-Memory OLTP engine uses True Multi-Version Optimistic Concurrency Control with FULL ACID Support. That is Transactions in In-Memory OLTP are Atomic, Consistent, Isolated and Durable. For instance any request for the Data Row from a Memory Optimized Table, the In-Memory OLTP engine gives the version of the Row which is current at the time of the request. Consider a scenario where two Transactions get the same version of the record and trying to update it with different values. In such a Write-Write conflict scenario the Transaction which is updating last will fail as the record which it is manipulating is not a current version of the record while committing the Transaction. Because of this Microsoft is suggesting us to have appropriate Try-Catch and Re-Trying Mechanism built in the Application. FALSE: In-Memory OLTP database engine component is fully integrated into Sql Server 2014 Relation Database engine, it is not a separate database product. 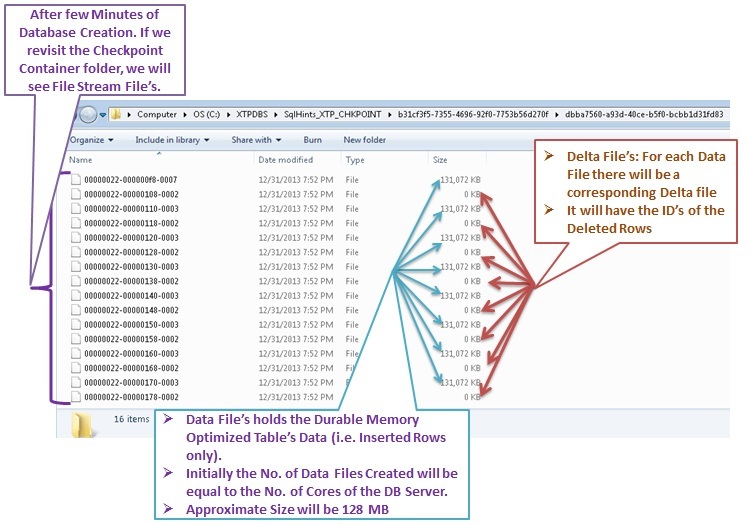 The Same SSMS which is used for the Disk Based Tables/Indexes is used for the Memory Optimized Table’s and Indexes. In that way, it provides the same development, Management and administration experience. IDENTITY Columns are Not Supported for Memory Optimized Tables, so the Best alternative is SEQUENCE. FALSE: For Memory Optimized Tables I assume SEQUENCE is not the best alternative for IDENTITY column. As request for NEXT SEQUENCE value is Synchronized to assure returning unique value. In case of a sequence object created with NO CACHE option each time a next sequence value is requested, it will write the calculated value to the system table before returning it to the calling statement. But if sequence is created with CACHE of Size 50, it will write to the System table only after each 50 sequence values are served. For more details you can go through the Sequence Cache management and Internals. But in either case it leads to resource contention and waiting for locks and latches, which indirectly blocks In-Memory OLTP from scaling. If possible please avoid Sequence for Memory Optimized Tables. Try to use something like UNIQUEIDENTIFIER data type and NEWID() function to generate uniqueidentifier value. Will explore more on this and will come back with performance results with Sequence, With UniqueIdentifier etc. There is No performance difference between the Memory Optimized Table and Disk based Table whose all the data pages residing in Memory due to Table Scan or DBCC PINTABLE. REALITY: Both the statements are FALSE. FALSE: In-Memory OLTP Database engine component doesn’t need Buffer Pool and also no 8KB data pages. Memory Optimized Tables provide better performance as the core engine uses the lock free algorithm (i.e. Multi-Version Optimistic Concurrency Control) which doesn’t require any lock and latches when the Memory optimized tables are referenced during the transaction processing. And for supporting Data Durability it still writes to the transaction log but the amount of data which is written to the log is reduced considerably. As the Indexes of the Memory Optimized Tables are only in Main Memory they will not be persisted on the disk, so to the log only the committed table data is written. But on the other hand in case of disk based tables whose data residing in memory due to Table Scan or DBCC PINTABLE it still needs buffer pool, it will have Locking, Latching and blocking. Any modification to the table data will result in writing both table and index data to transaction log. Note: The learning experience expressed in this article are based on the Sql Server 2014 – CTP2, it may change in the final release of the Sql Server 2014. Please correct me if any of my understanding is not correct. For In-Depth detailed information on the In-Memory OLTP(a.k.a. 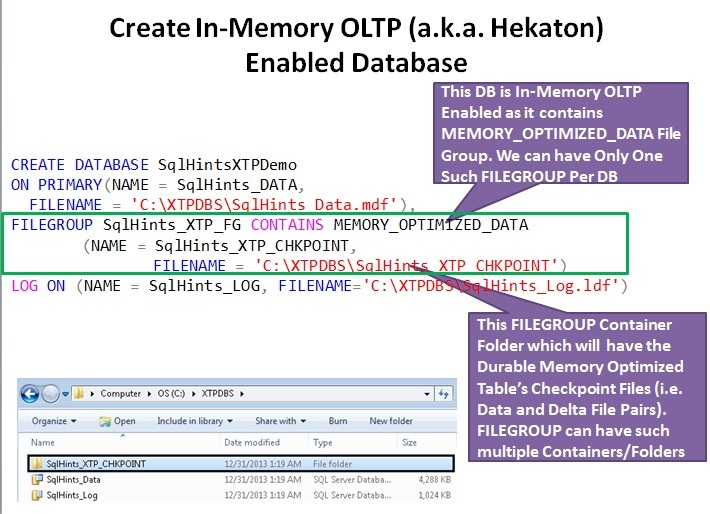 Hekaton), you may like to download the In-Memory OLTP White Paper written by Kalen Delaney or you can visit MSDN. You can as well download Sql Server 2014 CTP2. WHAT is In-Memory Online Transaction Processing (a.k.a. Hekaton)? In-Memory Online Transaction Processing formerly know as Hekaton is a database engine component which is optimized for accessing Memory resident tables. This component is fully integrated into Sql Server 2014 relation database engine, it is not a separate database product. It facilitates creation of Memory resident Tables (i.e. Memory Optimized Tables) and Indexes. It also provides the option to compile the Transact-Sql Stored Procedure accessing Memory Optimized Tables to Machine code. 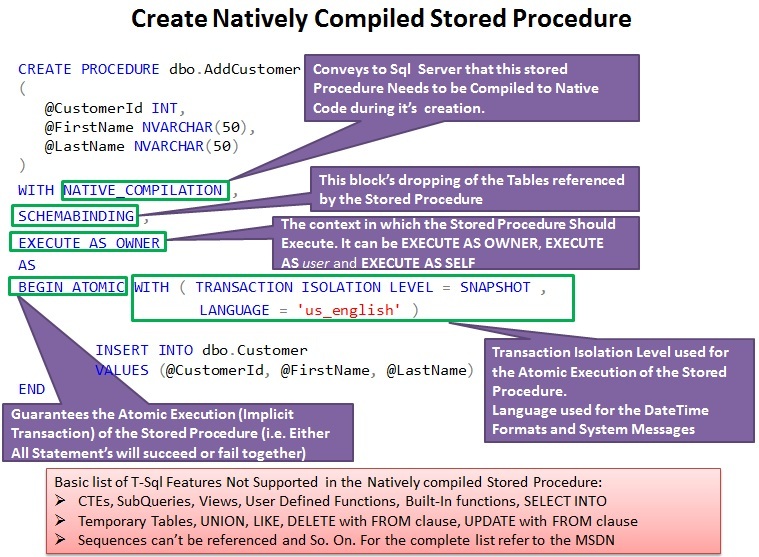 These Natively compiled stored procedures referencing Memory Optimized Tables provide better performance compared to the Transact-Sql Statement or Stored Procedure accessing Memory Optimized Tables. Memory Optimized Tables provide better performance as the core engine uses the lock free algorithm (i.e. MultiVersion Optimistic Concurrency Control) which doesn’t require any lock and latches when the Memory optimized tables are referenced during the transaction processing. And for supporting Data Durability it still writes to the transaction log but the amount of data which is written to the log is reduced considerably. As the Indexes of the Memory Optimized Tables are only in Main Memory they will not be persisted on the disk, so to the log only the committed table data is written. On an average it improves the performance of OLTP applications by 10x without having to re-write entire application (i.e. Just by migrating frequently used disk based tables by the OLTP application to Memory optimized table). WHY In-Memory OLTP (a.k.a. Hekaton)? Data of the Tables which are declared as Memory Optimized will reside in the Main Memory. Access to the Memory Optimized Table data doesn’t require the data to be loaded from disk to memory as complete Table and Indexes data is already present in the Memory. In-Memory OLTP doesn’t use the data pages and extents for storing Memory Optimized Table data. Instead it uses a special row structures. Each Row will have a Row Header, which contains the row’s Begin and End time. This Begin and End time is used to determine the validity of the row. Apart from this each row will have Index Pointers and the count of the number of indexes that are referencing it. All the tables data is linked by the indexes, so the requirement of minimum one Index for Memory Optimized Table. Memory optimized Tables Schema modification is not Supported. No Foreign Key and Check Constraints Supported. LOB Data Types are not Supported. Doesn’t Support Identity and Calculated Columns. Index for the Memory Optimized Table exists only in Main Memory and they are never stored on the disk. Index’s are updated only in Memory and it will not be logged/written to the Transaction Log. On System restart they are re-created as the table data is streamed into the memory. Hash index and Range Index are the types of indexes supported by memory optimized tables. And Each memory optimized table need to have at least one Non-Clustered Index. As index is the one with which complete Table data is linked. A Memory Optimized Table can have Maximum of 8 Indexes. The Memory Optimized Tables and the Stored Procedure referencing them can be compiled to Machine code via C Code generator and Visual C Compiler. Aggressive optimization is done at compile time i.e. when creating the Natively compiled Stored Procedures. Call to Such Stored Procedure is just a dll entry Point. 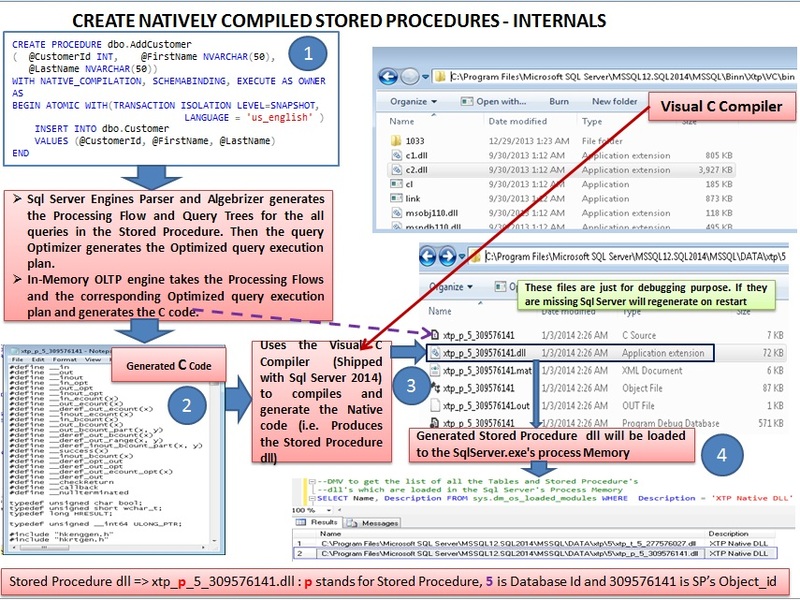 Natively compiled stored procedures referencing Memory Optimized Tables provide better performance compared to the Transact-Sql Statement or Stored Procedure accessing Memory Optimized Tables. In-Memory OLTP uses True MultiVersion Optimistic Concurrency Control, which doesn’t require any Lock and Latches when the Memory Optimized Tables are referenced during the transaction processing. In-Memory OLTP maintains the multiple versions of the Row’s. Each Row will have a Row Header, which contains the row’s Begin and End time. This Begin and End time is used to determine the validity of the row. For instance any request for the Data Row, the In-Memory OLTP engine gives the version of the row which is current at the time it is requested. Consider a scenario where two transactions get the same version of the record and trying to update it with different values. In such a Write-Write conflict scenario the transaction which is updating last will fail as the record which it is manipulating is not a current version of the record while committing the transaction. In-Memory OLTP provides an option to create Memory Optimized Tables which can have Durable Data. If tables are created with this option, data will not be lost even upon System Restart/Shutdown/Crash. Data Durability is achieved by the Data and Delta files in the Memory Optimized file group and by writing to the transaction log but the amount of data which is written to the log is reduced considerably. 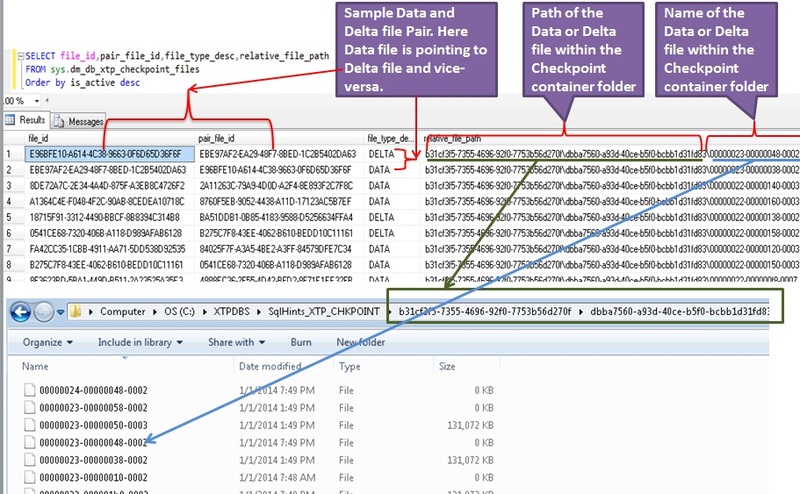 Here Data file of 128 MB size will have the inserted rows, whereas Delta file will have the ID’s of the Deleted rows. There will not be any transaction logging for the Memory Optimized Tables which are created without Data Durability option. And for the Memory Optimized Tables which are created with Data Durability option, will write to the same Transaction Log which is used by the Disk Based tables. But the amount of data which is written to the log is reduced considerably. It is because: 1) Index for the Memory Optimized Table exists only in Main Memory and they are never stored on the disk. Index’s are updated only in Memory and it will not be logged/written to the Transaction Log. 2) Only Committed data is written to the Transaction Log and UNDO transactions are not logged. 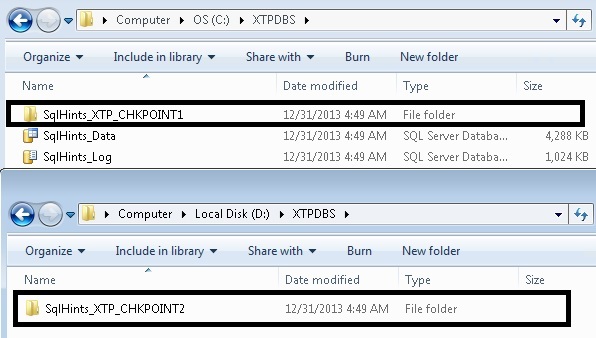 Sql Servers Database Backup option, back’s up the memory optimized file group. Transaction Log backup includes Memory Optimized Table log records. Differential Backup is not supported. No Buffer Pool In-Memory OLTP Engine doesn’t use the Buffer Pool, because the Memory Optimized Tables and Indexes data is already in Memory. Sql Server Integration In-Memory OLTP database engine component is fully integrated into Sql Server 2014 Relation Database engine, it is not a separate database product. The Same SSMS which is used for the Disk Based Tables/Indexes is used for the Memory Optimized Table’s and Indexes. In that way, it provides the same development, Management and administration experience. Garbage Collection As Update and Delete operation on the Memory Optimized Table creates multiple version of the rows. And the rows which becomes stale will unnecessarily consuming the Main Memory. For this In-Memory OLTP engine has a Garbage Collection System, which scans periodically and removes such stale rows.